Hello! We return today with part 2 of the Moderas Guide to Packing. Now that we got clothing out of the way (read it here ICYMI), we move on to accessories, beauty & toiletries. Accessories can make or break an outfit, but there’s no need for them to make or break you, when you find them in a knot, or worse, broken, or missing one of a pair in earrings. I would advise you to not carry too many accessories. Take pieces without colourful stones so that you can wear them for more than one outfit. Or pack within a certain colour spectrum & take one necklace/pair of earrings that goes with everything. But if you do end up taking more than one, I’ve got you covered. You know those sewing kits that make your way home from hotels? And those extra buttons on clothes? Use them wisely. Loop your earrings through one side & a rubber stopper (or a bit of an eraser, if you don’t have one). Now you’ll never have to worry about missing earrings again. Slip the buttons into a small box and you’re good to go. 2. 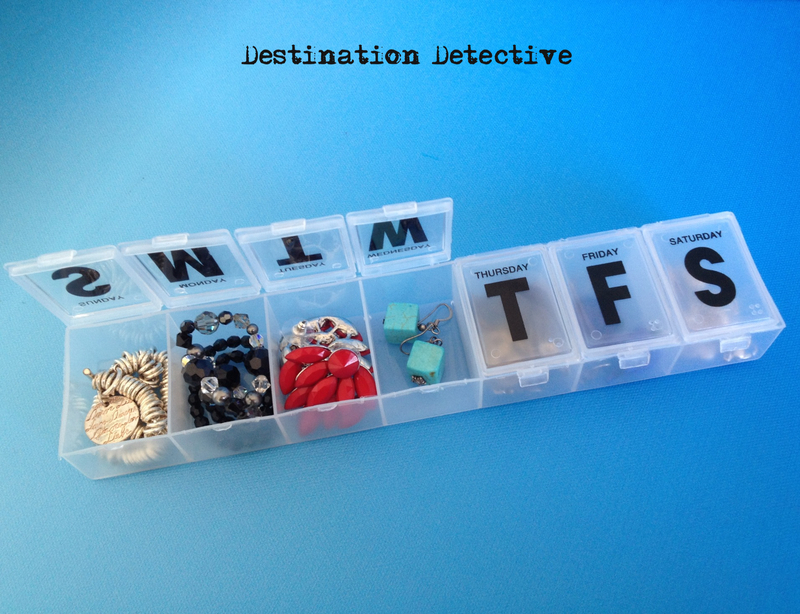 Use a pill box for rings, brooches, etc. Pill boxes are a godsend for organising. It can take anything from beads to baubles, and they fit into any bag because they’re meant to be portable. Use them for housing your fancy rings, bracelets, etc. This is a bit of an ingenious hack that I discovered on the Internet. 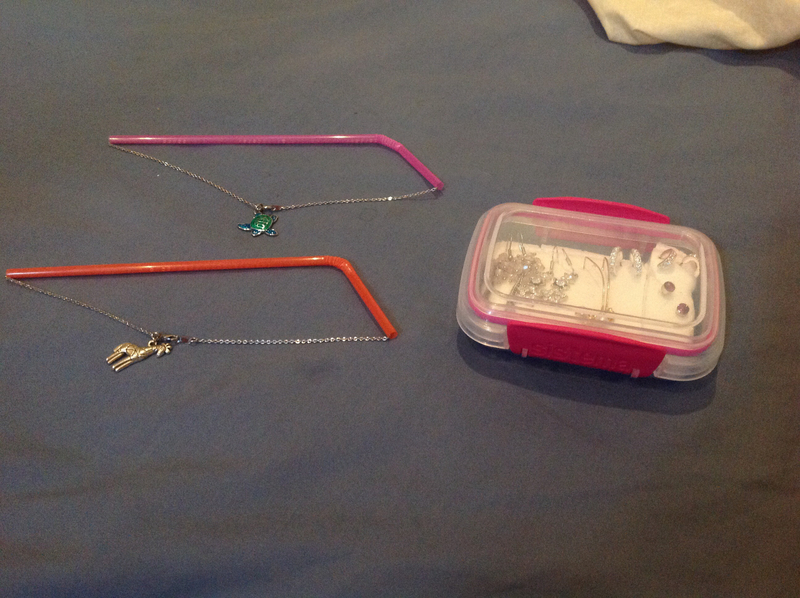 Thread your necklace through a straw (you can cut the straw to fit but it should cover at least half of the necklace) and put it in a pouch with your makeup. Tangled, annoying necklaces, be gone! When you’re on vacation, why carry an entire bottle of foundation? If you have acne prone skin, leave the bottle at home and take enough to act as concealer. Put some of the foundation in a contact lens case after emptying the solution, if any. Bonus, use it for cream blushes too. Contact lens cases are amazing- they’re spill proof, cute, and small enough to carry anywhere. Problem with liquids in hand luggage = solved. When I travel, I carry a black eyeliner, brown eye pencil, loose powder with SPF, BB cream in case of breakouts & a neutral lipstick. I also have BabyLips by Maybelline (in antioxidant berry) in my handbag for salvaging dry lips. That’s all you need, really. Why spend a lot of time in front of a mirror when you could be doing other things? Keep it simple. Unless you’re going on a hiking expedition or biking in the mountains, you shouldn’t bother about shampoos, conditioners, and the like. The world is getting increasingly smaller, and every drugstore & hotel will have basic amenities that can tide you over. If you have allergies or require specific treatment for scalp conditions, then take them. Otherwise, do yourself a favour and leave it at home. Slip glass bottles and perfumes into socks. I think that’s all we have for beauty! One more to go. What are your favourite, tried-and-true methods for packing accessories, makeup & toiletries? Share in the comments.